Happy New Year, and greetings from the IPSI Secretariat in Tokyo, Japan. IPSI and its members continue to stay active in a wide variety of projects and activities related to maintaining and revitalizing socio-ecological production landscapes and seascapes (SEPLS). We are looking forward to another great year of working with all of our partners and friends, with plans to hold the Eighth IPSI Global Conference (IPSI-8) later this year. Please continue to watch this newsletter for more details as they become available, as this will be an important event leading up to the post-2020 global biodiversity framework, and we hope many of you will be able to attend. Thank you to everyone who submitted an abstract in response to our recent call for submissions for the”Satoyama Initiative Thematic Review” volume 5. We will be letting you know about the results of the selection process soon. This month’s newsletter contains a report from a recent workshop on the IPSI-produced “Indicators of Resilience in SEPLS”, plus an announcement of an upcoming conference on plant diversity and climate change to be held in Ecuador. 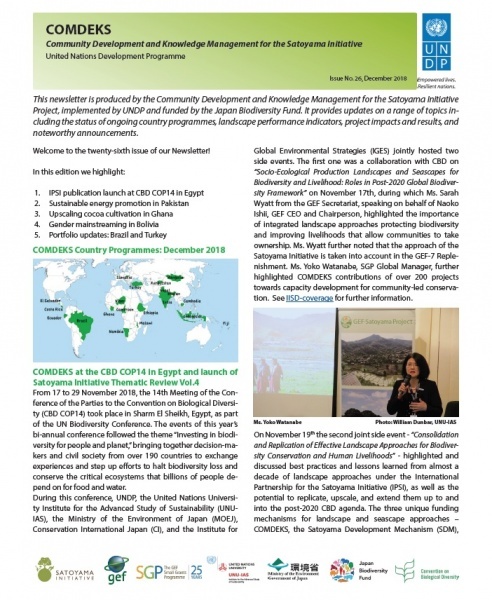 We are also pleased to share the latest newsletter from the COMDEKS Programme, an opportunity to apply for a postdoctoral fellowship at UNU-IAS, and a recent IPSI case study submitted by the Integrated Research System for Sustainability Science (IR3S), The University of Tokyo. As always, we hope you will contact us to submit any new case studies or other information about your activities, or if you have any questions or comments. We would like to try to increase our case studies as much as possible this year, so please consider if you can submit any of your work as an IPSI case study. Also, please do share any good photos or other media that the partnership may be able to use in publications and other venues to promote your work. Thank you as always for your help and support! An International Workshop on Resilience Assessment of SEPLS was held 16-17 January in Chinese Taipei, organized by IPSI partners the Soil and Water Conservation Bureau (SWCB) and the Society for Wildlife and Nature (SWAN International), focusing on the “Indicators of Resilience in Socio-ecological Production Landscapes and Seascapes (SEPLS)”. The IPSI Secretariat’s William Dunbar was invited as one of the two experts to lead the workshop, along with Dr. Ikuko Matsumoto of IPSI member the Institute for Global Environmental Strategies (IGES). The first day of the workshop consisted of a conference hall session in which the experts gave an in-depth introduction to the “Indicators of Resilience” project and resources available. On 17 January, participants traveled to the Gongrong community in the north of the island, where a resilience assessment workshop was carried out. The “Indicators of Resilience” are a tool for community-based resilience assessment, produced through IPSI collaborative activities. More information on the event is available on the UNU-IAS website here. The IPSI Secretariat recently received notice of a conference on “Past plant diversity, climate change and mountain conservation” to be held 11-15 March 2019 at the University of Cuenca, Ecuador. The conference is being organized in part by IPSI member the Neotropical Montology Collaboratory at the University of Georgia (USA). The content of the conference should be very relevant to those working with SEPLS particularly in mountain ecosystems, and IPSI members are encouraged to consider attending the conference if possible. UNU-IAS, host if the IPSI Secretariat, is now accepting applications for the JSPS–UNU Postdoctoral Fellowship programme. Jointly organised by UNU-IAS and the Japan Society for the Promotion of Science (JSPS), the JSPS–UNU Postdoctoral Fellowship programme provides promising, highly qualified, young researchers with the opportunity to conduct advanced research relevant to the main thematic focus areas of the institute. The UNU-ISI International Satoyama Initiative project is one of the programmes eligible for applications this year, so this could be a good opportunity for some readers in the IPSI community. Applications close 15 March, 2019, and must be submitted via the UNU-IAS online application form. 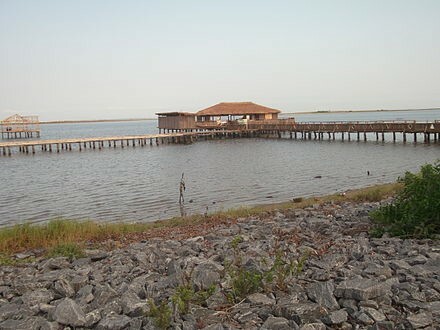 The IPSI Secretariat recently received a case study from partner organization Integrated Research System for Sustainability Science (IR3S), The University of Tokyo, titled “Safeguarding the Keta Lagoon Complex Ramsar Site (KLCRS) for Sustained Socio-ecological Benefits”.